Edward Parmentier, harpsichords (WLBR 8501). (David Sutherland, Ann Arbor, after anonymous 18th century Italian of the Cristofori school) Instrument preparation Edward Parmentier; Valotti tuning, Joseph Spencer. One of the recordings that established Wildboar’s reputation for daring and innovation in both sound and interpretation, this CD remains unique in all its dynamics. Parmentier’s energy and innovation remain hallmarks for all who hear and all who play the harpsichord. 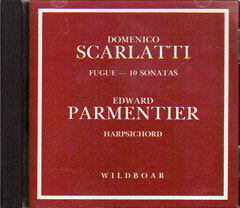 Vintage Parmentier, groundbreaking Scarlatti. Fugue in D minor K 417, Sonatas in E minor, K 263, 264; D minor K213; D major K 214; D major K 140, 224; B minor K 87, 27; A major, K 219, 24.